As a soup lover, I am always on the hunt for new and delicious recipes. I found this recipe online several years ago and it has become a staple in our menu. I love the combination of flavours and you never have to worry about it turning out bland. It is thick and delicious and super easy to make. This isn’t the best photo. I was racing out the door to hockey and thought I should snap a picture. If the truth be told the edge of the bowl is a little messy because it was not until my second helping that I thought about taking a picture. Discard the tough stem from the broccoli and coarsely chop. Melt the butter. Sauté onions and apples for about 10 minutes. Add the stock and broccoli. Bring to a boil, cover and simmer for 15 minutes. Purée the soup. Return to the saucepan and heat slowly. Add pepper and cream. Serve with grated cheddar and croutons. 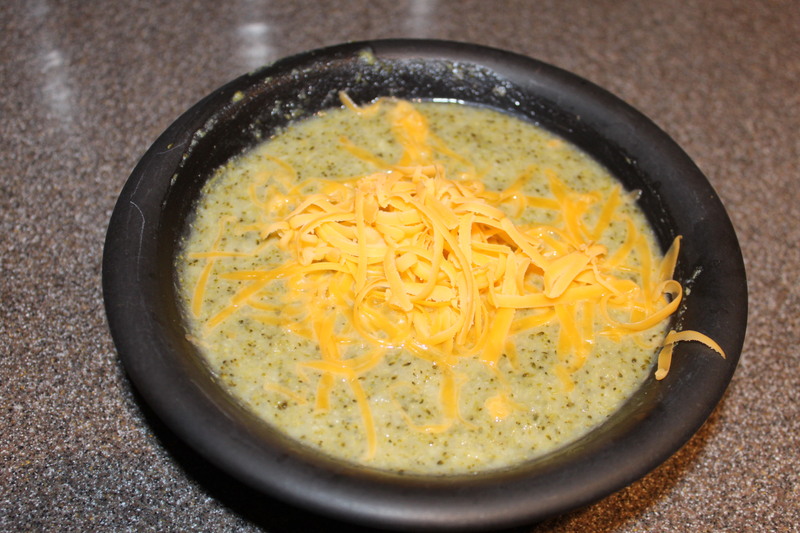 This Broccoli and Apple Soup recipe was originally found on Brittania.com. Posted on November 27, 2013 by Cindy Roy •	This entry was posted in Recipes, Soup & Sandwiches and tagged broccoli apple soup, broccoli soup, homemade soup, yummy broccoli soup. Bookmark the permalink.